Successfully Added X-Player Android 6.0 TV Box - 4K Movie Support, Octa-Core CPU, 2GB RAM, Google Play, Kodi TV 16.1, Dual-Band Wi-Fi to your Shopping Cart. Enjoy a true cinematic experience from the comfort of your own living with the X-player Android 6.0 TV box. With this 4K TV box you will be able to turn your regular television into a true smart-TV, allowing you to enjoy countless hour’s worth of online fun, games, movies, and a whole lot more. 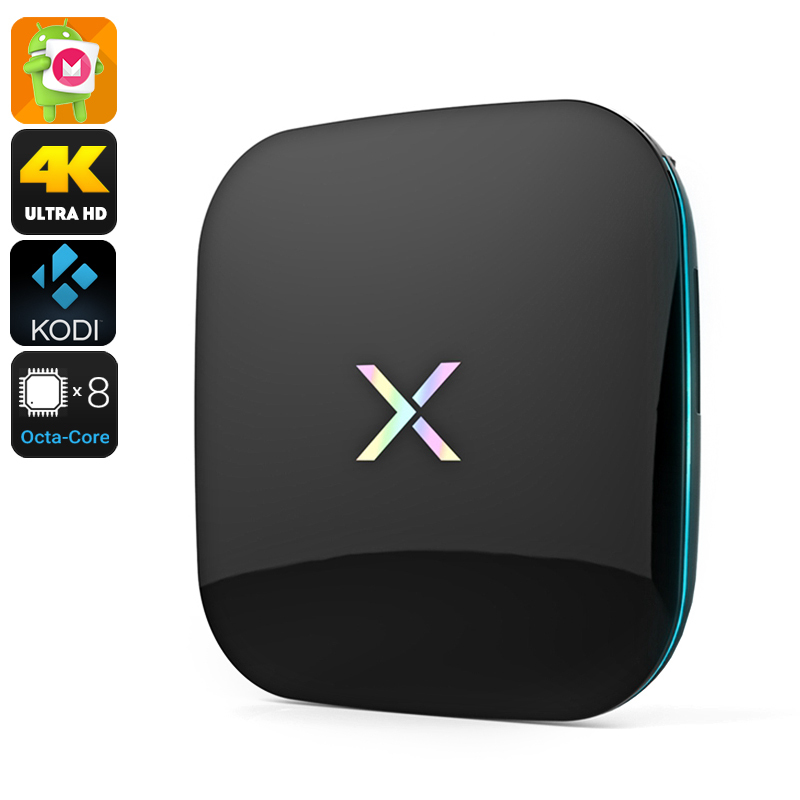 With Google Play installed and by supporting Kodi TV the X-player TV box literally gives you access to millions of free Applications, movies, and games that now can be enjoyed in breathtaking quality. So whether you like to sit back and play a game, browse the web, or enjoy a movie night with your friends and family – this Android TV box offers a solution to all your demands. Featuring an ultra-fast Octa-Core CPU that has been clocked at 2GHz this TV box is capable of smoothly handling what ever you throw at it. Watch movies in stunning 4K resolution and play the most demanding games – the X-player Android 6.0 TV box is the perfect home entertainment system that is guaranteed to bring hours worth of joy and fun into your household. With an internal memory of 16GB you can be assured that there will be enough space to store all your downloaded media and files. For the real movie addicts and gamers among us this Android 6.0 TV box additionally offers the possibility to throw in an extra 32GB of external memory, ensuring that even the most excessive users will have enough storage space to meet their demands. Supporting Dual-Band Wi-Fi the X-player Android TV box provides you with the fastest data speeds out there. Stream online movies in the blink of an eye and play the latest online games without running into any lag – with Dual-Band Wi-Fi a slow internet connection will be an issue of the past. Enjoy the latest features that Android 6.0 has to offer and download the most popular Apps in lightning speeds. With Google Play and Kodi TV support you can be assured that hour’s worth of entertainment lay ahead for you and all your loved ones. With the X-player TV box you will be able to impress all your friends and family with stunning 4K movies and more. With this smart-home accessory, there will never be another minute of boredom within your household. The X-player Android 6.0 TV box comes with a 12 months warranty, brought to you by the leader in 4K TV Boxes as well as wholesale electronic gadgets..